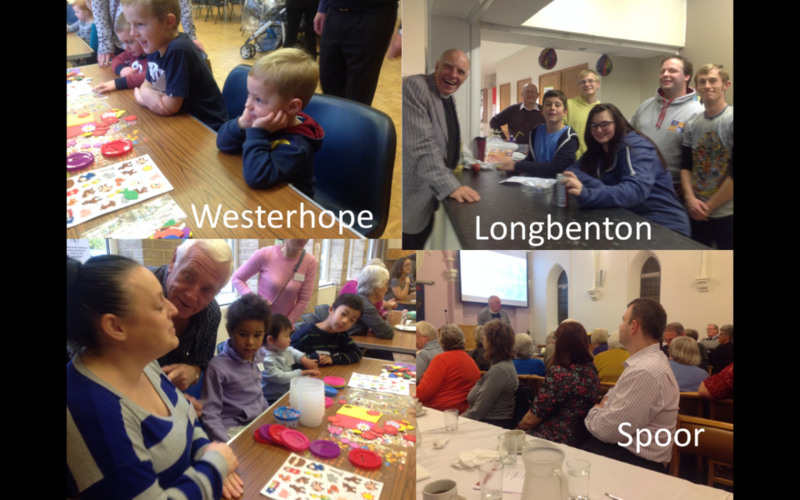 What a pleasure to join in with the Messy Church Family Fun at Westerhope this morning. I’m full of admiration for the teams running holiday clubs – you need lots of energy! It was a joy to see these two little boys in the picture listening so intently to the story of Zacchaeus. The look on their faces reminded me that these stories of Jesus are amazing and have power to change lives. Then down to Central station to pick up Rev Steve Wild (The President of the Methodist Conference) who has flown in from Hong Kong to spend a few days with us. He was so excited to hear about the teams and has already been praying for us all. He and I called into Longbenton to see the end of their youth session and then stay around for their community hour. This ongoing work at Balliol youth centre is good news and it was great to have some time to chat with the team and some of the local youth workers. This evening, Steve was the after dinner speaker at Spoor’s community meal. Steve has an amazing ability to entertain, make us laugh, yet still share some profound thoughts about the cross. His visit was very much appreciated and it was lovely watching people respond to his warmth and his words of encouragement. It occurs to me tonight that most of what the Together teams are doing should not be confined to a week of mission. Ok, we don’t have to have big events or holiday clubs every week…..but what we can do is have godly conversations. We might not have a community meal every week…but we can certainly offer prayer and a listening ear.